This pie is not Hungarian, much to my dismay. I spent a fair amount of time looking for the recipe under that name, only to realize I’d mixed up my geography. The internets cannot find things that don’t exist. 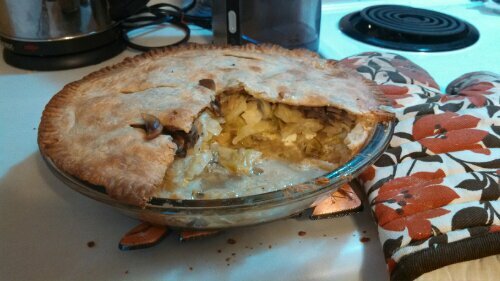 It was especially frustrating because I had found the recipe I wanted to try the week before. I was afraid I’d gone crazy. We made it…As written. It doesn’t specify how much dill, and I would put at least a 1/4 teaspoon. The 1/8 teaspoon of the other spices was plenty. The dough was a little difficult, though I didn’t follow directions well and cut the cream cheese and butter in at the same time. I had to use a bit of water to get it to come together. It rolls out thin, so be prepared for that. We made it one day and baked it the next, so it took a while longer to brown. We ate it…We’re still eating it, but I’d wager we’ll get 3.5 meals or 7 servings. And mostly because I was super hungry, so it could go 8 next time. We thought…This was a little weird but quite delicious. We might just use our regular pie dough next time for ease, perhaps using some whole wheat flour. We weren’t sure what the cream cheese added, so it might be easier to skip that next time. Overall it was a hearty meal that we enjoyed once it was finally done baking.